Give me 72 hours and I’ll show you a side of Florida you never imagined. Planning a Florida family vacation usually involves rushing from theme park to theme park to hop on the latest ride and pose in front of a selfie-worthy attraction. The other Florida family favorite is full of sunny beaches and sailing across the waters on a first cruise with kids clubs galore. But there’s a softer side to Florida that’s full of natural wonder and plenty of excitement of its own. Florida is home to an impressive 163 parks, 11 state trails and nearly 800,000 acres of state trails that would take a lifetime to explore. That leaves plenty of options for families whether they’re looking for a quick getaway from the hustle and bustle of coastal big cities, or want to explore beyond the picturesque Florida resort towns. Got 3-days to spend on your next Florida vacation? From natural springs to manatee sightings; these state parks deliver on family fun. Our friends at VisitFlorida have a few ideas to get you started. Located just 15 minutes south of Tallahassee, Wakulla Springs State Park is the perfect northern anchor for a springs road trip. For starters, this is the deepest freshwater spring in the world; don’t miss a chance to perform your best cannonball from the swimming platform. Wakulla Springs features 69 fresh springs and plenty of grassy beach to spread out and relax. Biking along the Nature Trail and Cherokee Sink Trail are also popular options with ranger-lead bike tours in winter months. And for history, nature and film buffs, if the scenery looks like something from a Tarzan movie, that’s because it is. Wakulla Springs is the location of many Hollywood classics, including “Creature from the Black Lagoon.” Be sure to take the famous river cruise while you’re there, too. Where to stay: Behold the glory of Wakulla Springs State Park and Lodge that’s listed on the National Register of Historic Places. This may not be like any lodge you’ve stayed in with marble bathrooms, walk-in closets and period furniture! If you’ve been in Florida for any length of time, this is probably the spring your parents told you about. 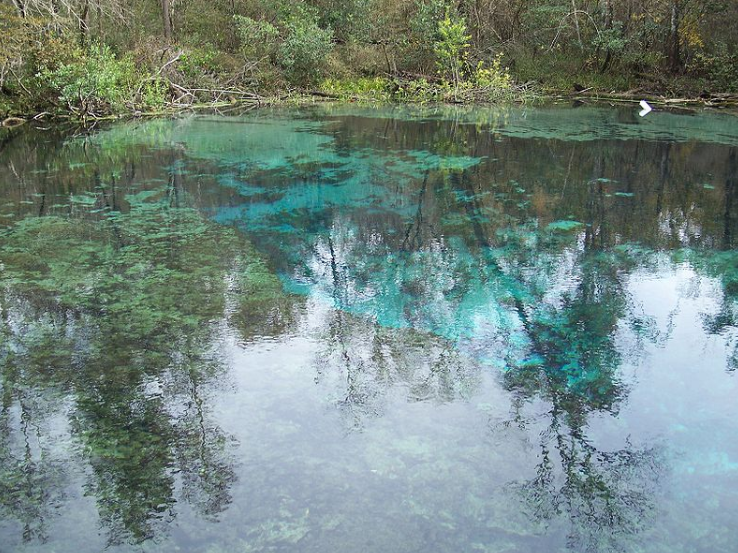 While there are several places around the state where you can take a tube trip, the Ichetucknee River rules them all. It’s a no-frills, easy going adventure that can be enjoyed by all, no matter if you’re 8 or 80. While there, hang out at headsprings and take the half-mile trail to Blue Hole Spring, another outstanding gem located in the park. Trust me, this is Old Florida at its finest. From May to early September, visitors take to their tubes and sail down the Santa Fe River. Snorkeling is also popular from October through March at Blue Hole, but divers must be Cave Certified. If you’re looking for something outside of the water, go on a wildlife hike before grabbing concessions for a picnic. The concession stand isfully stocked, but only available from Memorial Day to Labor Day. Where to stay: Cabins in the Ichetucknee Springs State Park area require a 2-night stay, but camping is also an option. And the quaint and out of the way Palms Garden Inn is a little over 10-miles away and comes outfitted with kitchenettes and pet-friendly rooms. It could serve as a comfortable, quiet and affordable base camp to work from while exploring your round-ups of parks. For a more rugged adventure, pitch a tent for the night in Ichetucknee Springs State Park. 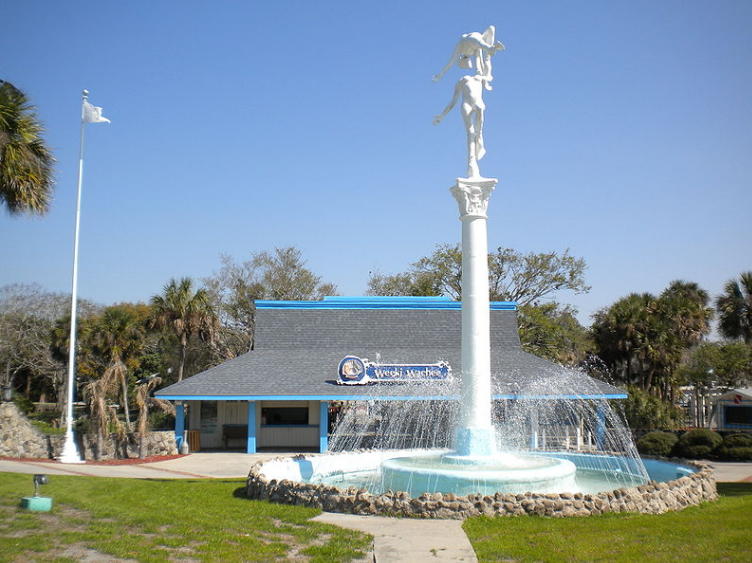 The next three stops happen right along scenic U.S. 19 along Florida’s Nature Coast. Make a stop at Fanning Springs State Park for a relaxing afternoon of swimming and picnicking. Guests can also enter Fanning Springs Park by cruising right up the Suwannee River, but be careful not to hit wandering manatees who call the area home. And if you have a kayak, make sure to bring it along -– Fanning Springs feeds the legendary Suwannee River, so you’ll definitely want to spend some time paddling while you’re there. Alternatively, Manatee Springs State Park is located just a few miles north of Fanning Springs in Chiefland, so you have a couple of great options in this area. For a break from swimming and paddling, head to the park’s Gazebo at the end of the wheelchair-accessible boardwalk. From here you can watch the river and keep an eye out for sturgeon jumping around in the water below. Where to stay: Reserve one of Fanning Springs State Park’s full-service cabins. Alternately, you can walk in by foot, bike or paddling on the Suwannee River Wilderness Trail for primitive camping. Where are some of your favorite Florida State Parks? Let us know by leaving a comment below!